Join Bobs Road Crew for an exciting Sunday group ride through the country roads of Wild & Wonderful West Virginia! Depart from Bob’s BMW Motorcycles at 9AM and arrive at Summit Point Motorsports Park by 11AM. On May 29, Bob’s BMW has arranged for BMW Factory Test Rider Nate Kern to ride the Shenandoah Track at Summit Point Motorsports Park with our customers! At 11:15, Nate will lead a group discussion for riders and spectators.The group ride to the track is intended for customers interested in attending as spectators only. The group ride is a great opportunity to come to the track and see what’s it’s all about and to decide if it’s something you might want to try in the future; because remember tracks days are not just about speed. Track days are meant to provide motorcyclists an opportunity to practice skills and get more familiar with your bike and its capabilities in a safe and controlled environment. All makes and models are welcome, not just sport bikes! NOTE: If you are interested in participating in the track day, meaning actually riding the track with Nate and MotorcycleXcitement coaches, you do NOT want to sign up for the group ride. 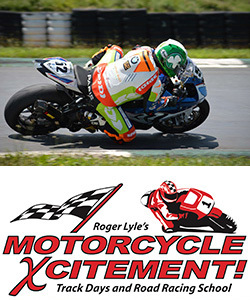 Instead you need to visit MotorcycleXcitement to register as a rider or visit Bob’s BMW Motorcycles TODAY and ask for the Track Day Package ($350 value for ONLY $225)!